I Hit A Deer…Now What? Call Breezy Point Auto Body, of course! In the Spring, you’re likely to notice more deer grazing along the road. While they may look sweet, these large animals can cause major damage if they collide with your car. Here are a few questions you may have if your vehicle comes face to face with a deer. Does my insurance cover the damage? The answer depends on which type of insurance you have. 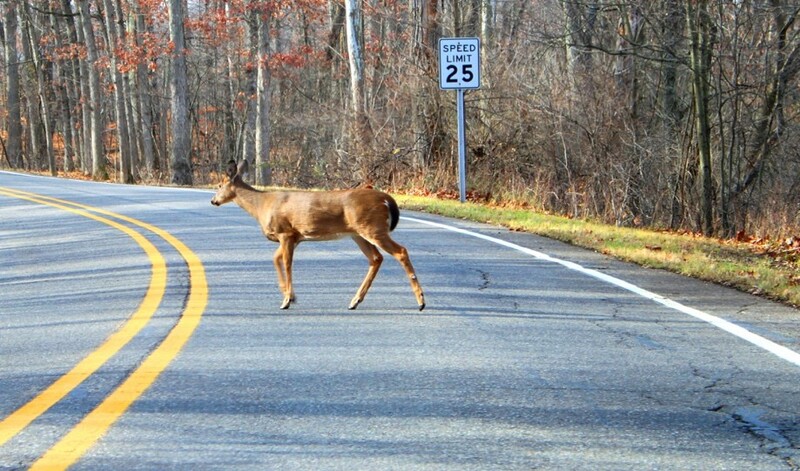 Damage from auto-deer crashes typically is covered under comprehensive insurance, not collision. Although the accident with the deer wasn’t your fault, you still will have to pay your comprehensive deductible amount. Typically, your mandated state car insurance does not include comprehensive coverage, so you’ll want to call your insurance company to make sure you are covered. While you may think this damage should be covered by collision insurance, contact with animals is specifically listed as a loss covered by “other than collision,” which is also known as comprehensive coverage. I swerved to miss a deer and I hit a tree, will I be covered? If you swerve to miss a deer and then hit something else, it is generally listed as a collision in your auto policy. The reason it’s considered a collision is because you were behind the wheel when it happened. It may not have been another car that you hit, but you still collided with something. This is why most insurance policies will treat it as a collision and therefore the coverage that you have for collision will be used to help with the damage to your car, medical bills, as well as any damage that may have occurred to signage or anything else that you would be held responsible for. Will the state pay for the damage or my deductible? While states are responsible for the roadways, they cannot control whether an animal runs into the road. No states will pay for repairs to your vehicle, or even your deductible if you hit a deer. Where do I take my car for repairs? If you hit a deer, the first call should be to the police. While a police report is not required, it may be helpful to have some paperwork backing up your claim. After that, you will want to give your insurance company a call. Once that’s all taken care of, you’ll want to start thinking about how and where to repair your car. You don’t have to go to the auto body shop dictated by your insurance policy, so take the time to shop around or use a reference from family or friends. Deer can cause major dents and even cracked or broken windshield glass. Luckily a full-service auto body shop like Breezy Point Auto Body can do all of the necessary repairs to get your car back to original shape. They can work on glass repair, dent repair, and can even match your paint job so the repairs look seamless. In the unfortunate occasion that your car has hit a deer and you’re in the Stratford, CT area, contact Breezy Point Auto Body for efficient repairs. Just so you have it handy, you can reach us by calling 203-378-4909 or use our convenient Contact Form. If you’d like to stop by our shop, set your GPS to 75 Access Road, Stratford, CT 06615.